Bonding with pet rats mostly just takes a little time, gentleness and patience, along with some delicious treats. These intelligent, sociable rodents become almost catlike once you bond with them. They'll be eager for a snuggle or petting, and willing to perch on your shoulder or stretch out on your lap. Rats do much better in general -- and they're more prone to easy bonding -- if they live with at least one other rat. Meet your rats' basic needs so they see you as a provider, setting the foundation for bonding. To be healthy, happy, sociable and able to bond, they must be well cared for. Get a roomy wire cage -- at least 2 feet in every direction for a pair, but the bigger the better. 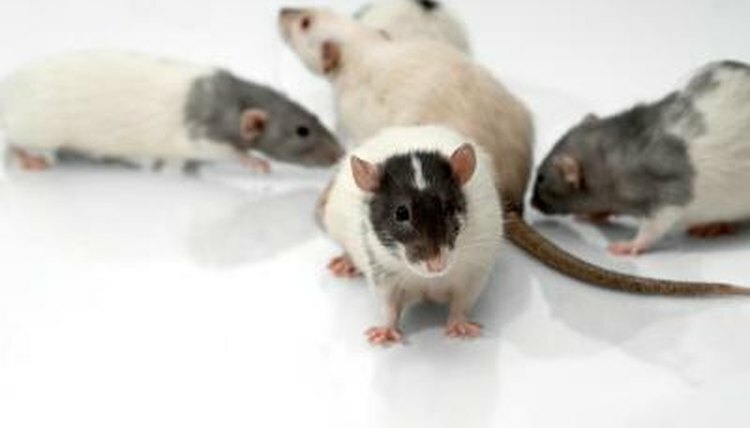 Rats require space to move around, play and keep their bathroom area separate. Supply toys and items they can gnaw to keep their constantly growing teeth in good shape. Provide high-quality rat block pellets daily and a constant supply of fresh water, along with a little supplemental rat-safe fresh fruit or vegetables every day or two. Remove soiled bedding, droppings and uneaten food daily. Every week, thoroughly clean the cage, dishes and other items and change all the bedding. Give your rats white toilet paper or paper towels to shred into nest material. They also need small houses and a solid exercise wheel that's big enough so their backs won't bend while they're on it. Once you begin taming and bonding, let your rats out of their cage for at least an hour per day. Bonding begins with hand-taming your rats, which itself starts with making first contact. Wait a day or two after getting your rats so they can adjust to their new home. Then, begin offering a small treat in your hand once daily. Place a piece of fresh fruit or vegetable, a morsel of rat-approved cereal, or a commercial rat treat in the palm of your hand. Hold it out for your rats in their cage and wait a minute or two, and speak quietly and encouragingly. Don't force the treat on them. If they're too skittish to make a move for it, try again the next day. Your rats will begin taking the treats within a few days, though some rats take longer than others. Once they eat comfortably out of your palm, start offering food from your fingers. Next, hold the treats just outside their open cage door, encouraging them to poke their heads out to get their rewards. After your rats unhesitatingly accept food from your fingers, it's time to complete hand-taming. Start picking up your rats by holding them one at a time in your cupped palm, with your other hand laid over their backs. Gently pet them, and speak to them quietly in an upbeat tone. If a rat seems upset, return her to the cage and try again after another day or two of hand-feeding. Don't try to hold your rats if you're in a bad mood; you're more likely to be impatient. Rats can sense stress and it makes them less comfortable and less trusting. Hold and pet your each rat for a few minutes every day. Offer a treat while you hold them so they associate being in your hands with good stuff. After the first week, reduce the treats to every other day, tapering them off over the next few weeks. Never completely stop giving treats, though. The more time and attention you give your rats, the deeper your bond grows. Sit near their cage every day and talk to them. Open it up and pet them once they're used to your hands. After they've been hand-tamed, rats should spend time daily in a secure playpen out of their cage. Hang out with them, pet them, speak to them, move their toys around and play with them. Offer an occasional treat, although at first they might not be interested in eating outside their cage. True bonding occurs one-on-one, so make time to pick your rats up individually. Let them perch on your shoulder or hang out in your lap. Snuggle and pet your rats, and don't forget to talk to them individually.